Our range of services include scara robot. There was a new name in robotics at the Hannover Fair, with automation giant Delta launching a new SCARA robot and a robot controller with integrated servo drive. Visitors to the Delta stand were able to witness live demos of the company’s SCARA robot arm solution which it says is capable of improving daily productivity by up to three times through high-speed and high-precision compliance control for production lines in the electronics, packaging, materials industries and more. Features of the DRS40L SCARA robot include an arm length of 400mm and a load capability of 3kg. 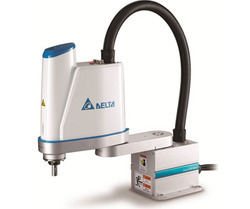 Delta says the DRS40L Series SCARA robot features compliance control functions without sensors, and offers excellent speed, linearity, verticality and repeatability to rapidly and precisely perform operations such as insertion, screw locking, assembly, load and unload, pick and place, stacking and packaging. The automatic process path planning function fulfills industry needs for conveyor tracking processes such as gluing, deburring, coating and soldering. Further, with the aid of Delta’s machine vision systems, it can perform smart identification, inspection and sorting to effectively reduce defect rate for consistent quality delivery. When matched with control units and other peripheral devices such as servo systems, machine vision and linear modular, the SCARA becomes a highly integrated workstation. Alongside the SCARA robot, Delta also showed its ADSA-MS series robot controller with built-in servo drive. Delta says this unique simplified architecture enables motion control of up to 10 axes (4-axis robot + 6 external axes). To date Delta has only announced availability of the SCARA robot in China and Tawian, but you have to assume, given that it was being displayed at Hannover, that it will be coming to Europe in the near future. Visit the Delta website for more information.